…and she was just going to spring over, when she heard a deep sigh, which seemed to come from the wood behind her. “There’s somebody very unhappy there,” she thought, looking anxiously back to see what was the matter. 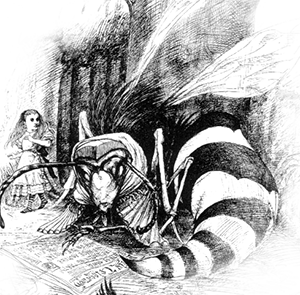 Something like a very old man (only that his face was more like a wasp) was sitting on the ground, leaning against a tree, all huddled up together, and shivering as if he were very cold.